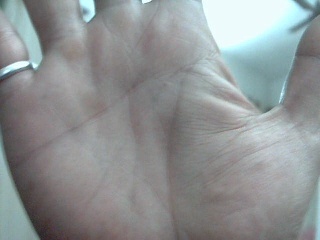 The heart line on my left palm starts between the mounts of jupiter and saturn and there is a gradual slope until it reaches the percussion under mercury. Going by most palmistry literature I'd say it runs its normal course. Ofcourse it is striated towards the end. However in the right hand it is tasseled on both ends and runs straight on the hand with great descending off-shoots which begin as it passes the mount of apollo. I have a hea dline which is joined to the life life at the beginning and the heart line on the right seems to end under saturn with one of the striations or descending offshoots seems to want to touch this head line . In fact a very minute offshoot (it isnt a regular descending line just an offshoot) seems to have already touched my sloping head line. The general effect is that I do not have much of a quadrangle to show.This peculiar heart line nearly forms an angle with my hea dline. Please do comment .....this has me a lil alarmed...please can anyone help?? ?